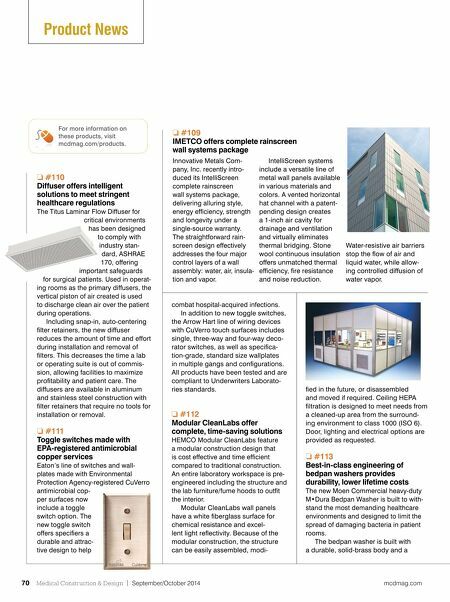 mcdmag.com September/October 2014 | Medical Construction & Design 71 chrome fi nish that can handle the harshest industrial clean- ers. Thought- fully designed with the help of nurses, the spray face is extended to include a rounded lift handle for both safety and ease of movement. An opti- mized spray force and concentrated spray pattern allow for bedpan washing without splashback, keeping arms and surfaces clean. Additionally, integral arm alignment ensures the arm consistently points to the center of the bowl. #1 ❏ 14 Beaufurn enters panel category with sound-absorbing Accusta Beaufurn intro- duces Accusta, a contempo- rary collection of sound- absorbing acoustic panels designed to mitigate noise. The Italian- designed, fl at and pyramid- shaped panels combine acoustic improvement with aesthetics. Created to relieve excessive reverberation, Accusta comes as wall or ceiling panels in seven different colors, which can be installed vertically, horizontally or diagonally to achieve modern or classic patterns. The 17-inch by 17-inch panels are created with molded, medium-density polyester felt and covered with a colored poly- ester fabric. The material is sound For information on these products or from any of our advertisers, visit www.mcdmag.com/products. #1 ❏ 17 JACLO products help complete ADA-compliant bathrooms JACLO's new Luxury Grab Bar collec- tion has adjustable sliding hand-shower mounts, which can help to complete an ADA-compliant bathroom without sacrifi c- ing luxury, design and performance. A variety of designs, lengths and angles are available that can be applied for both the toilet and the shower. Installing a Luxury Grab Bar with a JACLO hand shower attached to it allows for versatility in height for the water. New grab bars include pieces that match the recently launched Contempo and Cubix collections. #1 ❏ 18 Mass notifi cation system features centralized dashboard Desigo Mass Notifi cation from Siemens' Building Tech- nologies Division is a new, fully integrated multi- modal commu- nication system that can be used in a single building or across a large campus for relaying a series of emergency and non-emergency messages. 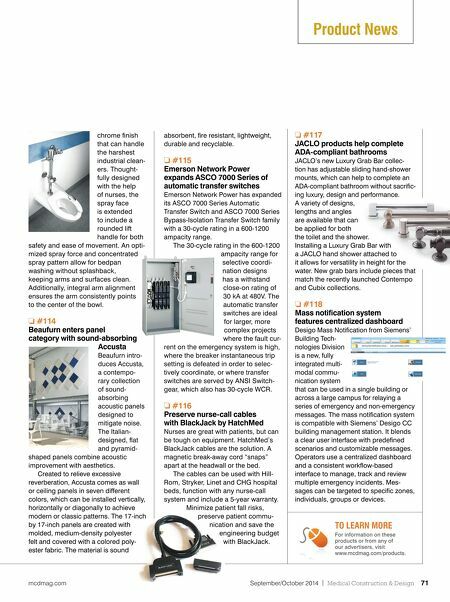 The mass notifi cation system is compatible with Siemens' Desigo CC building management station. It blends a clear user interface with predefi ned scenarios and customizable messages. Operators use a centralized dashboard and a consistent workfl ow-based interface to manage, track and review multiple emergency incidents. Mes- sages can be targeted to specifi c zones, individuals, groups or devices. Product News TO LEARN MORE absorbent, fi re resistant, lightweight, durable and recyclable. #1 ❏ 15 Emerson Network Power expands ASCO 7000 Series of automatic transfer switches Emerson Network Power has expanded its ASCO 7000 Series Automatic Transfer Switch and ASCO 7000 Series Bypass-Isolation Transfer Switch family with a 30-cycle rating in a 600-1200 ampacity range. The 30-cycle rating in the 600-1200 ampacity range for selective coordi- nation designs has a withstand close-on rating of 30 kA at 480V. The automatic transfer switches are ideal for larger, more complex projects where the fault cur- rent on the emergency system is high, where the breaker instantaneous trip setting is defeated in order to selec- tively coordinate, or where transfer switches are served by ANSI Switch- gear, which also has 30-cycle WCR. #1 ❏ 16 Preserve nurse-call cables with BlackJack by HatchMed Nurses are great with patients, but can be tough on equipment. HatchMed's BlackJack cables are the solution. A magnetic break-away cord "snaps" apart at the headwall or the bed. The cables can be used with Hill- Rom, Stryker, Linet and CHG hospital beds, function with any nurse-call system and include a 5-year warranty. Minimize patient fall risks, preserve patient commu- nication and save the engineering budget with BlackJack.